In recent times, a number of Chicago reissues is popping up, to quench the thirst for classic house releases. However, a new life of the oldies by Trax, DJ International, Chicago Underground, etc. does not mean that ghetto and jack are sending only messages from the retirement. Clone sublabel Jack For Daze is in the front row of Chicago-inspired music, combining the Windy City’s nostalgic flair with the new production energy. JFD’s recent “Off The Chain” comes from Vin Sol, a Californian export to the world located in sunny San Francisco, where he runs Soo Wavey Records with another artist Matrixxman and has previous label experience with UTTU. 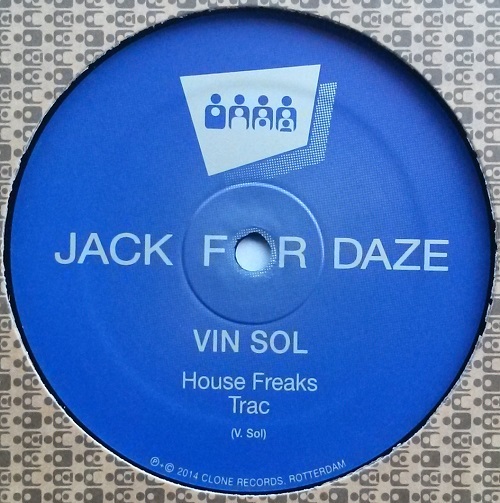 A Dance Mania admirer, Vin Sol knows the secrets of freaky beats when hitting with a four-tracker on the Dutch label. Vin Sol applies a simple toolbox with vocal samples, claps, hi-hats and filtered stabs for a common good of dance-obsessed audience. The main riff of the flanging and whipping opener “Off The Chain” is of the memorable type and gets the party going, followed by booty-shaking undercover mission “Shox”. 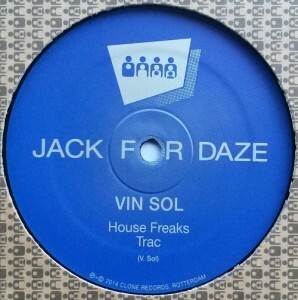 Further juice is squeezed out in “House Freaks”, while in bluntly titled “Trac” battering drums operate in shades for a nocturnal stripped cut. Have been playing that a lot and will be even more.